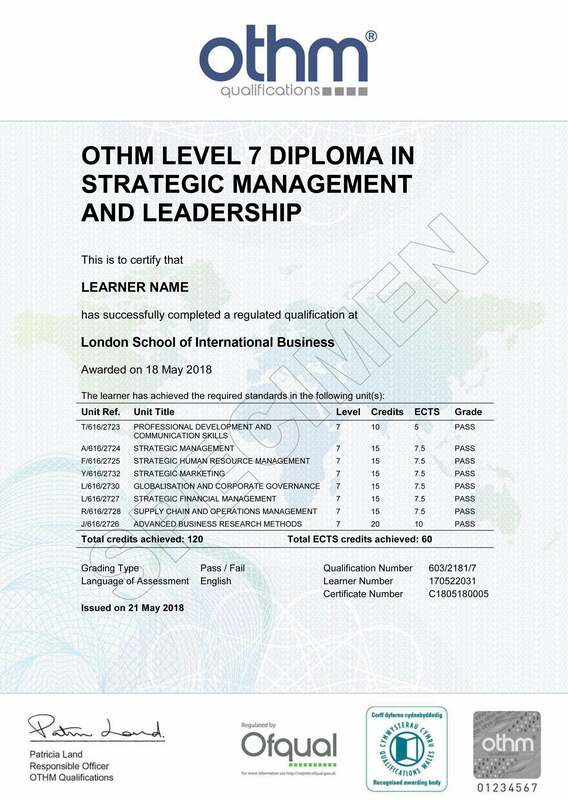 The objective of the Level 7 Diploma in Strategic Management and Leadership qualification is to develop strategic management and leadership skills for managers who have the authority and personal attributes to translate organisational strategy into effective operational performance. The objective of Level 7 Diploma in Strategic Management and Leadership qualification is to develop strategic management and leadership skills for managers who have the authority and personal attributes to translate organisational strategy into effective operational performance. This qualification reflects current practice in Strategic Management and Leadership and allows learners to develop and expand their high-level understanding of strategic management and leadership in the workplace. This qualification is suitable for mature learners with a background in academic study or industry. The qualification has a clear work-related emphasis on practical skills development alongside theoretical fundamentals. This Level 7 qualification represents practical knowledge, skills, capabilities and competences that are assessed in academic terms as being equivalent to Masters Degrees, Integrated Masters Degrees, Postgraduate Diplomas, Postgraduate Certificate in Education (PGCE) and Postgraduate Certificates. The Level 7 Diploma in Healthcare Management consists of 4 mandatory units and select 3 or 4 optional units for a combined total of 120 credits.